This article was last updated Aug 10, 2018, but some terms and conditions may have changed or are no longer available. For the most accurate and up to date information please consult the terms and conditions found on the issuer website. The Wells Fargo Cash Wise Visa® Card – $200 Cash Rewards Bonus is a decent option for the shopper who wants to earn cash back but doesn’t want to deal with rotating categories, activation or spending caps. This card has a $0 annual fee and offers unlimited 1.5% cash rewards on everyday net purchases. That’s a consistent rate for all purchases, however, it isn’t the highest cashback rate when compared with competitors’ offerings. You can easily find other cards that offer a flat rate of 2% cash back — or even up to 6% in certain categories. But, those cards may come with an annual fee. Check out other cashback cards if you want to earn the most cash back. Also, if you want to save money during a 0% intro APR period, this card doesn’t have the best offer on the market; others offer longer intro periods or $0 intro transfer fees. The Wells Fargo Cash Wise Visa® Card – $200 Cash Rewards Bonus doesn’t really have any noteworthy features. It offers your free FICO® Score, but this has become standard for most cards. The cellphone protection is a good feature that provides peace of mind if your phone is damaged or stolen. Terms and conditions apply. This card has a mediocre cashback rate that isn’t as high as competing cashback cards’ rates. You can find a higher rate with cards like Citi® Double Cash Card – 18 month BT offer. This card also charges a foreign transaction fee of 3% so you should not use this card when traveling abroad. Cellphone protection: Simply pay your monthly cellphone bill with your card to receive coverage for any damage or theft that may occur. You’ll get up to $600 of protection (subject to $25 deductible). Free FICO® score: Receive free access to your credit score, allowing you to monitor it and be aware of any changes. 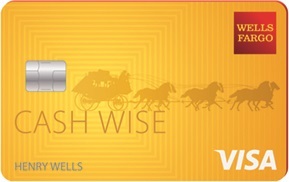 The Wells Fargo Cash Wise Visa® Card – $200 Cash Rewards Bonus should be used for everyday purchases. If you frequently use Google Pay™ or Apple Pay® mobile wallet, purchases made during the first 12 months after account opening will earn a higher 1.8% cashback rate. To maximize your rewards, it may be beneficial to pair this card with another cashback card that will earn you a higher cashback rate in certain categories, like gas or groceries. To earn the Cash Rewards Bonus, make sure to spend the required amount in the given time period: $200 cash bonus after spending $1,000 in the first 3 months If you plan on making a large purchase or transferring a balance, do it as soon as possible so you can use the majority of the intro period. Check out our balance transfer resources. The Wells Fargo Cash Wise Visa® Card – $200 Cash Rewards Bonus offers unlimited 1.5% cash rewards on everyday net purchases. There are no category restrictions or signups needed to earn cash back. During the first 12 months from account opening, you will earn 1.8% cash rewards on Google Pay™ or Apple Pay® mobile wallet purchases. This allows you to earn additional cash back on select purchases for a limited time. Cash rewards can be redeemed for merchandise, physical and electronic gift cards, travel, cash, digital rewards and charitable donations. Cash redemption options by phone or online are redeemable in $25 increments only. Cash redemptions by withdrawal from a Wells Fargo ATM or a rewards redemption to an eligible Wells Fargo account from a Wells Fargo ATM are redeemable in $20 increments only. Note: You must have a Wells Fargo Debit or ATM card in order to redeem rewards at a Wells Fargo ATM. There is a Cash Rewards Bonus of $200 cash bonus after spending $1,000 in the first 3 months that can increase your cash back during the first few months of card opening. The Wells Fargo Cash Wise Visa® Card – $200 Cash Rewards Bonus and the Citi® Double Cash Card – 18 month BT offer differ in cashback rate, sign up bonus, and purchase intro rate. The Citi® Double Cash Card – 18 month BT offer is a better option for those who want to earn more cash back since you will earn Earn 2% cash back on purchases: 1% when you buy plus 1% as you pay compared to the unlimited 1.5% cash rewards on everyday net purchases you earn with the Wells Fargo Cash Wise Visa® Card – $200 Cash Rewards Bonus. This is a significant gap that can mean the difference between hundreds of dollars in cash back. Here is a breakdown of the key element for each card. Balance Transfer Fee 3% for 120 days, then 5% 3% of each balance transfer; $5 minimum. The Wells Fargo Cash Wise Visa® Card – $200 Cash Rewards Bonus is a below-average card that offers a subpar cashback program and few additional cardmember perks. If your goal is to earn a high cashback rate, look to other cards that can increase your rewards.